Edinburgh based firm of monumental sculptors founded by Stewart McGlashan (sic) (1807-73). McGlashan was born in Campbeltown on 17 November 1807, the son of a builder, James MacGlashen. Marrying Mary Buchanan at the Barony Church in Glasgow, on 22 September 1833, the couple had at least nine children, two of whom died in infancy. 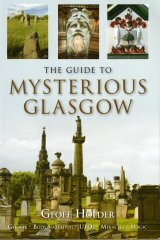 He established his first workshop in Glasgow in 1842 at the Southern Necropolis, and lived at 81 Lawmoor Place until around 1846, before moving to Edinburgh, where he set up his business at 1 Canonmills and later at the gates of Dean Cemetery. He is listed in the Edinburgh Post Office Directories from 1847. After his death in 1873, his son Stewart (b. 2 March 1839) took over the business as S McGlashan & Son. From 1881, the spelling of the family's surname in the Edinburgh Post Office Directories is given as McGlashen. By 1898, he had also set up a yard at 8 Grange Road. Hugely prolific in their output of monuments for Glasgow and Edinburgh�s cemeteries, the firm was also responsible for a number of public monuments, including the Sir William Wallace Monument, Robroyston, Glasgow (1900), and the monument to the Scottish Horse (Boer War) in Edinburgh�s Princes Street Gardens (1905), both of which are Celtic crosses. They were also responsible for the memorials to Robert The Bruce (1889) and the Boer War in Dunfermline Abbey (1905). Their cemetery work includes the monuments in Paisley�s Woodside Cemetery to Thomas Glen (1886) and Dr Daniel Richmond (1885); and the Catherine Watson Memorial, North Berwick, which features a bronze portrait (1890). Most of their finest monuments are in Edinburgh Cemeteries, particularly at Dean and Warriston, including the Celtic cross commemorating the architect John Cunningham in the latter (1873). A particularly unusual monument in Warriston is their polished granite obelisk to James Wilson, the Chief Clerk of the Scottish Fishries, which is surmounted by a futuristic, space helmet-like finial (1898). Lt John Irving RN, a cross with a bronze relief of the Franklin Expedition by William Brodie (1849); Major General William Gairdner, a classical temple with military accoutrements (1861); Rev Francis Gillies, with a bronze portrait (1862); and James Brown Howard, the former manager of the Lyceum Theatre, who has a stone cross and portrait medallion (1895). The elder Stewart McGlashen died of heart disease at the age of 66, on 9th September 1873, at 1 Eyre Place, Edinburgh, and was buried in the city's Warriston Cemetery. His son, Stewart, lived at 4 Brandon Street in 1891, and at 5 Brandon Street a decade later. He died in the early years of the century, and was survived by his wife, Agnes Lang McGlashen, and their daughter, Mary Buchanan McGlashen.